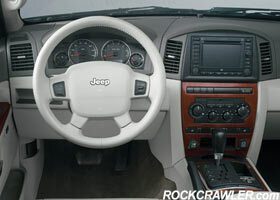 Auburn Hills, MI - In an effort to improve the overall driving experience of the all-new 2005 Jeep® Grand Cherokee, the Chrysler Group has enhanced its vehicle communication options through practical applications, all of which can be experienced at the touch of a button. A DVD entertainment system – consisting of center-console-mounted DVD player, overhead LCD monitor, wireless remote control, and two wireless headsets – is located for rear-seat passenger enjoyment. In addition to video DVDs, the system will play audio DVDs, audio CDs, MP3 audio discs and video CDs. There are also plug-in jacks on the housing to show video from a video camera, connect video games for display on the screen and play music directly from an MP3 player.A unique feature of the DVD entertainment system, operated by the remote control unit and made possible by the vehicle’s Controller Area Network system, is the ability of the vehicle speakers to play audio from a disc in the DVD player while the headphones play audio from the satellite radio, AM/FM radio, or a disc in the radio CD player.